M54B30 vanos removed track car, will be on the market soon. Just done it Andy, I used ti arms onto E30 beam with E30 bushes. what Glenn said, Chris did the Bilsteins in my E28 racecar, excellent guy very good. 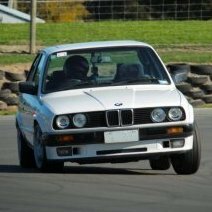 Best Brake Booster For M52B28 E30 Conversion? I used the E32 double chamber one on our M54B30 race car conversion, standard fitment, excellent brakes. Plenty of stop, 10mm clearance, would recommend it to anyone. We also run with the Mazda front calipers. You know you're good when you can do your optimum, 2 tenths is my closest, normally about 4 or 5 tenths off tho. Nice James, I'll get there one day to play. Thanks Guys but needs to be E30 med case and 3.64 or 3.45. Built by Chris Wright, ran in BMW series for a year or so, then Auckland Car club for a while. Chris is in Mt Wellington, Auckland. Need a 405 ECU, green label. From E34 M50B20 or 25, 89 to 93. Urgently needed to race this weekend, any about? Thanks, David.